The Home Fitness Test was created by the team at Topendsports to provide a simple protocol of tests that can be done by anyone at home. The author, Rob Wood, has the unique combination of a PhD in Exercise Physiology and qualifications in Graphic Design. These skills has seen him host and write the sies like this on fitness testing. During his studies in Human Movement at The University of Western Australia, he spent time at the Australian Institute of Sport and the Western Australian Institute of Sport. After gaining his doctorate (PhD) in Exercise Physiology from UWA in 1999, he was employed as an exercise physiologist at the Northern Territory Institute of Sport, where he was responsible for the training and testing on many of their elite athletes. Following a personal interest in art and design, Rob studied graphic design at the Canberra Institute of Technology, graduating with an Advanced Diploma in 2002. He then worked as a graphic designer in Canberra before travelling and has been working full time on his web sites since. 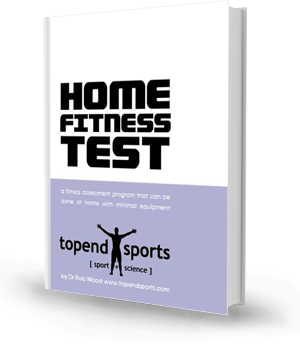 See more details about our free Home FItness Test ebook.